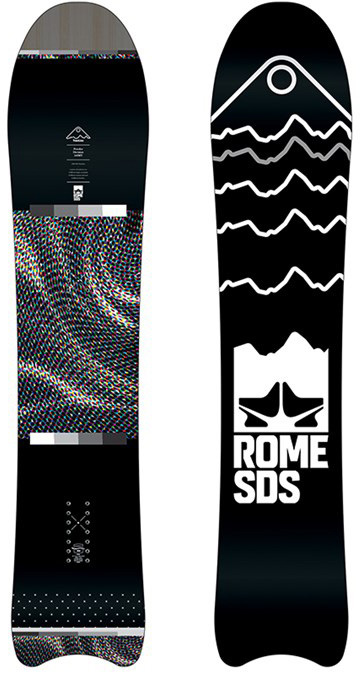 The Rome Powder Division MT comes in everything from a short fatty to a more traditional surfy shape. Each size is different but there is one theme I’ve picked up on after riding 2 of the 4 shapes. They all are well thought out and rip for this price point. They are made to shine in powder but when set all the way forward it is great to carve up groomers. It’s another not just for powder ride and isn’t necessarily ready for the shelf when the powder is gone. It’s a super strong recommendation for a budget quiver builder or someone who only likes to surf the mountain and want’s one board. The 2019 Rome Pow Division doesn’t seem to have any real changes compared to the 2018 model that we own but it still sits as one of our favorite short/fat/surfy rides for 2019. Ethics Statement: We don’t do reviews in exchange for compensation from the Manufacturers. This is our attempt at an honest and objective review from an average riders perspective. How This Review Happened: We borrowed this for an extended demo, then returned it but liked it soo much we asked for a 157. Then we bought a 153. We only do this with our favorites like this. Conditions: Everything from soft groomers to almost 1 foot of super thick powder to some almost waist deep powder and some early morning slackountry time with Drift Boards. Approximate Weight: Feels like it’s on the lighter side of normal and it’s not a heavy board. Sometimes lower-cost boards like this can be heavier but its not the case here. Flex/Buttering: The Rome Powder Division 157 has a pretty medium flex in the nose but it gets stiffer as you get down to the inserts. From there to the tail it has a pretty medium/stiff flex. It isn’t really a board you get to butter but it can work if you want to make it happen. On Snow Feel: The mellow camber from the end of the front inserts to almost the tail makes for a pretty stable ride and the 3D rocker in the nose makes for a pretty floaty easy ride underfoot. It’s got a subltle turn up of the sides that seems to have a very similar easy floating feel to hybrid camber. It has a very back foot heavy/sufry personality that is fun to ride on groomers and it doesn’t have to be just a board for powder. Very easy to one foot and flat base for sure. Edge Hold: Nothing here that says go carve on ice but the Rome Powder Division holds a really good edge for nothing going on with the sidecut. It can hang in the borderline hard snow without getting to slippy when on edge. Turn Initiation: Pretty quick edge to edge for such a wide board and it really surprised us all at how quickly it turned for this width. There is some taper of -12mm, but it isn’t as much as you would think for this kind of shape and we thought it would hinder the quick turn initiation. It wasn’t a tree cheetah but I never felt uncomfortable turning in semi-tight spots with this. Yes, it felt best in more open terrain but it was a good surprise when it came to navigating through trees. Turning Experience: A lot of boards marketed as mostly powder boards like this often are pretty boring when it comes to riding groomer riding but I had a lot of fun setting the stance all the way forward and making some fun turns on some mostly groomer days. Carving: You can make some use of this back seat camber and the Rome Powder Division makes for a pretty fun all around ride. Skidded Turns: Even with camber all the way to the tail it doesn’t feel too catchy and skidding out a turn is very doable. Speed: Very fast base for this price point and It has a pretty good glide to it. The nose, being a little softer than the rest of the board can clown shoe up a bit but it isn’t that floppy. Uneven Terrain: The bigger the bumps got, the more it made these size 9ers of mine to weave in and out of the bumps but it did better than I thought it would for how wide it is. The Rome Powder Division has very good dampening properties that allow the board to stay flexy and damp but not buck us around. It is great in tracked up snow. Powder: The Rome Powder Division lives up to its name and it has a really effortless float in the deepest of deep. When set all the way back with a 22″ stance width you can get about 13.5″ back on board which is pretty massive. That combined with the 3D rocker nose and the 12mm of taper makes for a super-floaty ride. Switch: not that good but just looking at the board you would know that. Jumps: Pretty strong pop off the tail for such a mellow camber. The one thing one of my friends who rode this thing that really rips is if you get a lot of air the board can feel a bit soft but for most of us exceptionally average riders here at The Good Ride, that won’t be an issue. Pipe: Not my kind of pipe ride but pretty fun to slash some walls with. 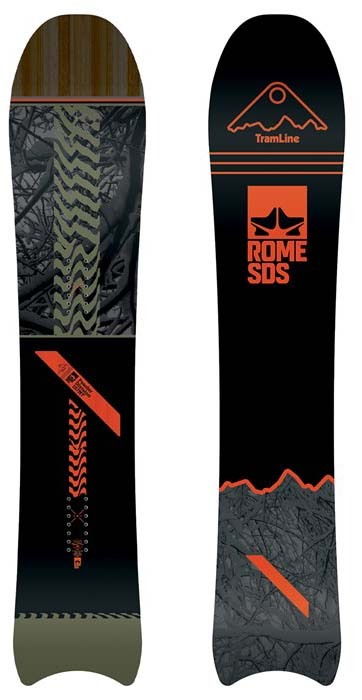 So the Rome Mountain Division makes for a really amazing powder board but what makes this more recommendable is the ability to make turning and slashing groomers a lot more fun than your average powder board. This is one of our top recommendations for those that want a short/fat/surfy in the smaller sizes or just a surfy ride in the bigger sizes. It is a great budget quiver ride and the lower price doesn’t equate to sucking some stoke out of those deep days we all live for. We try to get as many images of the Rome Powder Division MT, but forgive us if they're not all there.